Motor vehicle crashes are the leading cause of death among 15 to 20-year-olds. 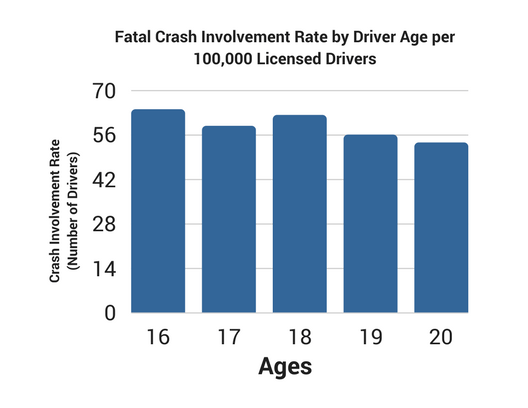 Drivers ages 15-20 accounted for 12% of all drivers involved in fatal crashes in 2008 and 14% of all drivers involved in police-reported crashes. 16-year-old’s have higher crash rates than drivers of any other age, and are 3 times more likely to die in a motor vehicle crash than the average of all drivers. Statistics show that 16- and 17-year-old driver death rates increase with each additional passenger (IIHS). 63% of teenage passenger deaths in 2008 occurred in vehicles driven by another teenager. Among deaths of passengers of all ages, 19% occurred when a teenager was driving (IIHS). 81% of teenage motor vehicle crash deaths in 2008 were passenger vehicle occupants. Hand-held cell phone use was highest among 16- to 24-year-old’s (8% in 2008, down from 9% in 2007). 37% of male drivers ages 15-20 who were involved in fatal crashes were speeding at the time. 55%, or 2,014, of the 3,678 occupants of passenger vehicles ages 16-20 who were killed in crashes were not buckled up. 31% of drivers ages 15-20 who were killed in motor vehicle crashes had been drinking some amount of alcohol; 25% were alcohol-impaired, meaning they had a blood alcohol content of 0.08 grams per deciliters or higher. 2008 Number of Deaths vs. Injuries Requiring Emergency Room Visit. 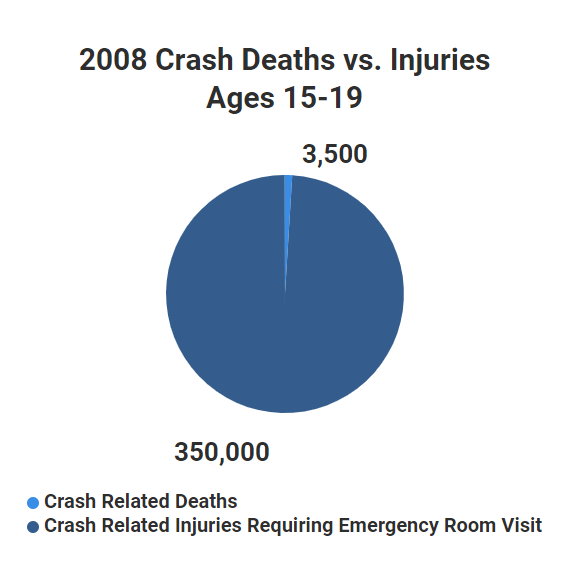 While the total number of automotive deaths of teens is a sobering statistic, when compared to the total number of injuries requiring emergency-room attention, the true cost of teenage driving accidents is made apparent. In 2006 (latest data available) crashes involving 15- to 17-year-olds cost more than $34 billion nationwide in medical treatment, property damage and other costs, according to an AAA analysis. Teen drivers receive twice as many traffic citations as all age groups combined, increasing insurance costs for their families and other teen drivers. 2,739 drivers between the ages of 15 and 20 died in motor vehicle crashes in 2008, down 13.7% from 3,174 in 2007 and down 20.2% from 3,431 in 1998. About 2 out of every 3 teenagers killed in motor vehicle crashes in 2008 were males (IIHS). Graduated Drivers’ Licensing (GDL) is becoming law in many states. GDL’s generally restricts nighttime, expressway, and unsupervised driving during initial stages, but lifts these restrictions with time and further testing of the individual, eventually concluding with the individual attaining a full drivers’ license. In states where GDL’s are required, accident fatalities for teen drivers has dropped by up to 30%. Many families are building upon the success of the GDL programs, and are tailoring their own Parent-Teen Driving Contract (PTDC) that meets their families specific needs and expectations. No state has the optimal GDL program. Our Parent-Teen Driving Contract can be tailored to meet you families particular needs, and guide you in a discussion with your soon-to-be teen driver about driving safety, responsibility, your expectations, and the consequences of disobeying your rules. By far the best time to have this conversation with your teen is before they actually get their license. Studies show a much higher teen acceptance rate when the rules and limitations of the PTDC are set early, and that the teen understands their driving privileges depend on meeting their obligations in the agreement. Trying to implement a Parent-Teen Driving Contract after the teen has been driving for several months or years generally receives greater resistance from the teen, and can be much harder to implement successfully. The exception is if the teen has already had an accident, received a traffic ticket, or has had driving privileges revoked for some other reason. In these cases the PTDC (along with any other remedial training mandated) can be used to help the teen begin driving again.